From 2020, Mandai will house two new attractions- a bird park and rainforest park, with public spaces, an education centre and eco-friendly accommodations. 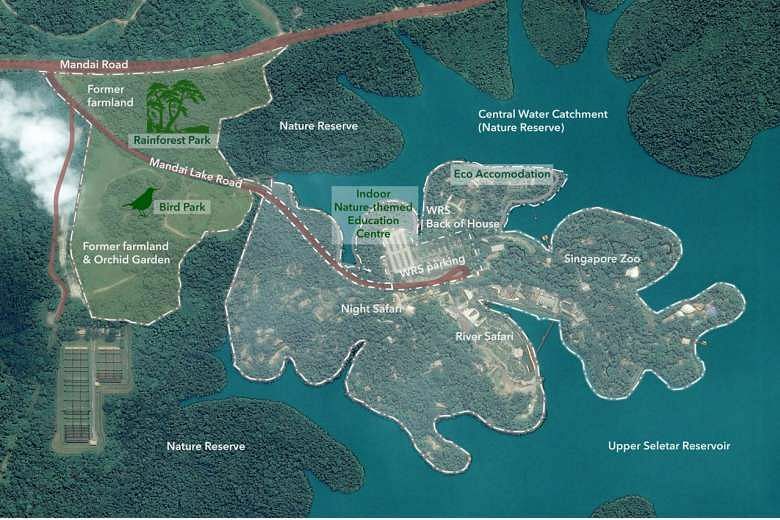 SINGAPORE - Mandai is set to become bigger and better, with plans underway to turn the leafy swathe of land in northern Singapore into a 126ha eco-tourism hub. The area now houses the Singapore Zoo, the River Safari and the Night Safari. But from as early as 2020, they will be joined by two new attractions - the Bird Park, which will be relocated from Jurong, and the new Rainforest Park. There will also be eco-sensitive accommodations such as camps, tents and family rooms. At the Rainforest Park, visitors can go on a "multi-layered adventure" on aerial walkways that extend from the forest floor to the treetop canopies. Over at the Bird Park, visitors can observe birds in their natural environments at the nine aviaries with different landscapes from around the world, such as wetlands, bamboo forests and rainforests. The feathered creatures will be allowed to fly free, so visitors can observe their natural behaviours in a setting designed to replicate their native habitats, developer Mandai Safari Park Holdings said at a media briefing on Wednesday (June 1). The Bird Park will also house a breeding and research facility, which aims to increase the populations of critically endangered species such as the Bali mynah, black-winged starling and blue-crowned laughing thrush. The developer also announced plans to build an eco-bridge, similar to the one over the BKE, spanning Mandai Lake Road. The road links the central and northern parts of the Central Catchment Nature Reserve, with the whole Mandai area just outside of it. Mr Mike Barclay, group chief executive of the Mandai Safari Park Holdings, said: "We want to give Singaporeans a nature and wildlife destination that they can call their own. Visitors have asked for more novel, engaging and immersive experiences and we hope the new Mandai nature precinct will provide all that and more. We are also mindful of the need to provide appealling public spaces so that everyone can enjoy the beauty of the Mandai nature precinct. "Our vision is to create an integrated nature and wildlife destination, nestled within our bustling city for all Singaporeans and tourists to enjoy. Generations of Singaporeans have grown up with Jurong Bird Park and the wildlife parks in Mandai. This project provides an opportunity for renewal, and to deepen our collective affinity with the nature and wildlife of our region." Plans for the massive Mandai makeover were first announced by Prime Minister Lee Hsien Loong in September 2014, during a live television forum. PM Lee had said then that the area would be rejuvenated with a "bigger, better zoo". Jurong Bird Park would also be moved there, he said. Nature groups had expressed concern then that the "Disneyfication" of the area could negatively affect wildlife there. The authorities sought to allay these concerns, saying that care will be taken to ensure the area is developed sensibly. They also said the development will take place on previously occupied and already impacted land. An Environmental Impact Assessment (EIA) was also undertaken and results of this will be announced in the coming weeks. Mr Tony O'Dempsey, spokesman for the Nature Society (Singapore), told The Straits Times on Wednesday: "We are concerned in general for the effects of the development on the native fauna that have been using the site as a linkage between two fragmented sections of the Central Catchment Nature Reserve. "We are working with the developer to try and influence certain aspects of the design so that linkage between the parts of the nature reserve is sufficiently maintained."